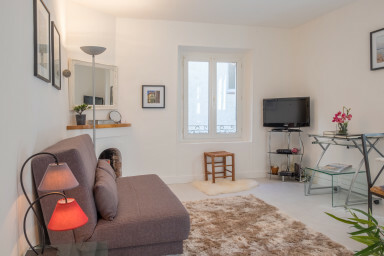 Located in a traditional French house, in the center of Cannes and only 3 min to Palais des Festivals and less then 10 min to the beach, this is an ideal apartment both for holiday and congress. Walking distance to everything. You will have a bedroom with two single beds and a living room with a sofa bed. Dinner table for four persons. The apartment is best suited for a couple or a family with one or two children. Fully equipped kitchen with washing machine. Air conditioning and wifi. Although this is a flat in an older house, there is double glazing making the apartment quiet in the evenings and nights. The apartment is located in the central part of Cannes known as the “Cannes banana" because of its shape that looks like a banana with its extension along La Croisette and the beaches. Located on a side street to Rue Meynadier, one of Cannes’ oldest commercial streets and only 2-3 min to the Vieux Port (old port). At det lå sentralt var nesten det eneste som var positivt. Aircondition virket ikke bra nok, så det var konstant nesten 30 grader inne hele tiden. Sengene var også av dårlig kvalitet.